As the outbreak of Ebola in Liberia continues to take its toll closing schools, putting some government employees on compulsory leave and slowing down economic activities, several institutions and individuals have been making donations to the fight against the virus. For some, the donations have been directed towards the Ministry of Health and Social Welfare and other institutions that are involved in fighting the virus, but the Gbowee Peace Foundation Africa (GPFA), established by Liberia’s Nobel Laureate Leymah Gbowee, is engaged in the fight against Ebola differently by using community leaders, mainly youth and women, to create massive awareness about the virus. The foundation on Friday provided US$45,000 to 83 community groups across the country, including rural and local media institutions, to be used to create massive awareness on the prevention of the virus. 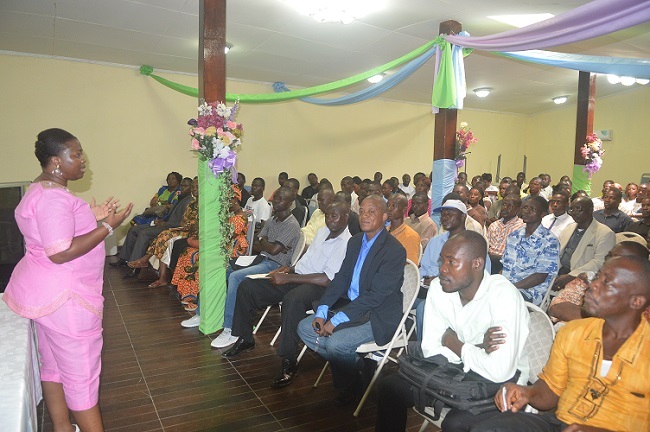 This was during a one-day workshop held at Musu’s Spot in Congo Town, just outisde Monrovia, the Liberian capital. Mrs. Gloria J. Davis-Wayne, who works in the prevention and control department of the Ministry of Health and Social Welfare, spoke to the participants about the necessity of public awareness. Mrs. Wayne, a public health practitioner, said the fear about the virus could be one major factor resulting to patients’ death as she indicated that people who contract the virus live with so much fear that they will not survive and as such it adds to the already deadly nature of the virus. “You need to apply all the preventive measures. But also when you are infected don’t say you cannot survive and so you do not want to go to the hospital to report it. You can survive if you get to the medical center soon. There are many of our friends and nurses that have survived and are today with us”, she said. According to her, the virus is deadly but can be prevented when people bear in mind that most medical practitioners and caregivers who have bodily contacts with patients are mainly at risk of contracting the virus. She stated “all you need to do is to go into your communities with these posters and explain to the people to stop doubting Ebola. It is real. Don’t explain what you do not know about the virus. It will confuse people. Go and explain the health and preventive tips from the Ministry of Health on these posters”. The MOH volunteer on Ebola awareness said people should stop focusing on reading the long history of the virus instead of looking at the simple preventive measures. Mrs. Williametta E. Saydee-Tarr, Executive Director of the Gbowee Peace Foundation Africa told the group leaders that their support is highly essential in ensuring that Ebola is eradicated from Liberia. 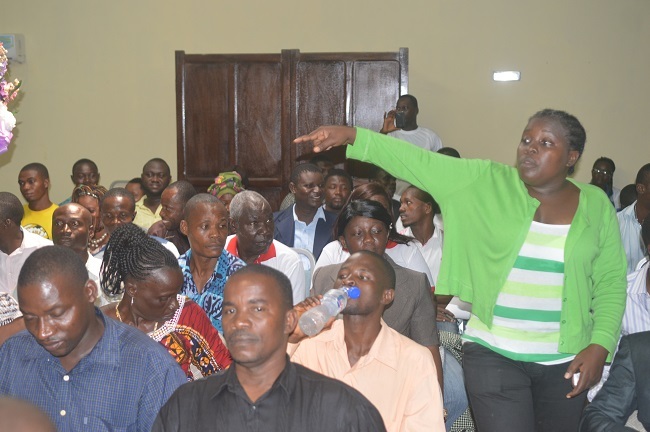 She said not every Liberian will want to accept messages on radios and newspapers and as such to add up to the good work of the media institutions, community discussions are needed to convince people that the virus exists and can be prevented. The GPFA Executive Director challenged the leaders to serve as messengers for their communities as awareness, education about the virus from communities will help the spread. “Go as peace ambassadors, call small meetings, group discussions, one on one talk and create awareness to your people. No physical touch, washing hands, these are the things you should be telling your people and we are counting on you for good results”, she appealed. “We are happy because since we started the process in July and August reports from our community group have impressed our donors to support us. They feed that the money they were given were actual going to the communities. They will do more as we all try to fight Ebola”. 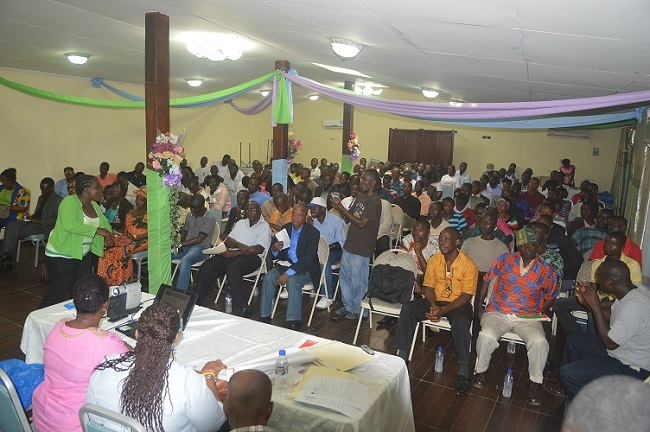 She added that the foundation will work to ensure that these community leaders use the little funding to work and show prove of their work through community meetings and discussions on the prevention of Ebola. Earlier, the chair of the board of the foundation Cllr. Deweh Gray encouraged community leaders to send their report after they have completed the work. She said this was important because the donors want to know the impact of the funding. “We should show gratitude when you receive something. Some community groups that received month ago are yet to report as a result it is difficult for us to explain. Please let fight this deadly ebola virus with accountable,” she pointed out.